The California Angels’ No. 1 pick in the 1971 baseball free agent draft out of Detroit Catholic Central High School, Tanana also had to decide from among more than 100 college basketball scholarships. He chose baseball, and the lefthander with a sizzling fastball hurled 21 years in the major leagues and finished with a 240-236 won-lost record and a 3.66 ERA. He notched 2,773 strikeouts to rank among the all-time leaders for left-handers. Tanana pitched for the Angels, Boston, Texas, Detroit, New York Mets and New York Yankees. In 1979, he fired a complete game 4-1 victory over Kansas City in the American League playoffs to give the Angels their first-ever post-season victory. 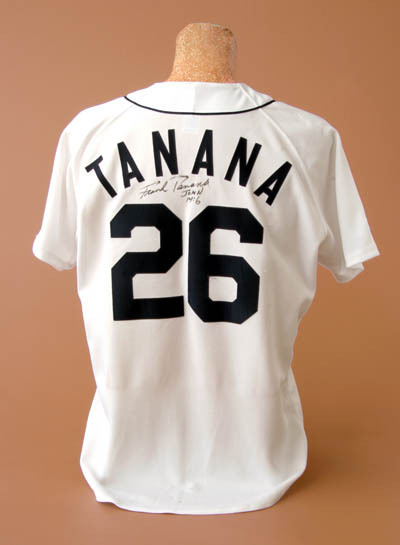 Tanana pitched Detroit to a 1-0 win over Toronto on the last day of the 1987 season to clinch the AL East Division crown and complete an unbelievable seven-game year-end Tigers’ sweep of the Blue Jays, each game decided by one run. It truly was the fulfillment of the American boyhood dream. He was the high school athletic standout. He carved out one of history’s most successful major league pitching careers by a lefty. And a significant chunk of that career was spent in his hometown, pitching for the Tigers he loved so much as a youngster. For Frank Tanana, it wasn’t merely a dream. He actually made the make-believe come true. The rewards have been many for Tanana. His induction into the National Polish-American Sports Hall of Fame reflects the significance of his career. The honor, however, is emphatically justified. During a 2l-year major league career, Tanana pitched his way to a 240-236 record with a now unheard of 3.66 ERA. After pitching for the California Angels, he went to the Boston Red Sox, Texas Rangers, Detroit Tigers, New York Mets and New York Yankees. Based first on a sizzling fastball and later on an embarrassing-to-hitters wicked curve, Tanana notched 2,773 strikeouts to rank among history’s all-time leaders for left-handers. Tanana, of course, made the most of his blessing. It also was the result of a lot of sweat and blood and dogged determination. Since his boyhood days on Detroit’s near west side, Tanana was surrounded by the sports of baseball and basketball. Not only was he California’s No. 1 pick in the 1971 free agent draft out of Detroit’s Catholic Central High, he also had established himself as one of the nation’s most highly recruited basketball prospects. A two-time All-State forward/guard, Tanana was recruited by more than 100 colleges. He had committed to Duke before signing with the Angels. Tanana’s father, Frank, also was a distinguished athlete. After leading Detroit St. Andrew to two state basketball championships in the early fifties, he played outfield for five years in the Cleveland Indians minor league system. He returned to Detroit and spent more than 30 years on the Detroit Police Department. The elder Frank died in 1995. But he enjoyed several proud years watching his son pitch for the Tigers from 1985 to 1992. Tanana provided his family and all Tiger fans with plenty of thrills. Perhaps the most significant occurred on the last day of the 1987 season when he fired a complete game 1-0 victory over Toronto to clinch the American League East Division title. Another pitching highlight came in 1979 when Tanana fired a complete game 4-1 victory over Kansas City in the American League playoffs to give the Angels their first ever post-season victory. Tanana and Nolan Ryan formed one of the deadliest one-two pitching punches in history while they were teammates at California. While Tanana savors his career, he has better things than to dwell upon it. Tanana certainly does that by spending as much time as possible with his family and making a variety of appearances speaking on the importance of a sound Christian life. Tanana and wife, Cathy, live in Farmington Hills. They have four daughters. His mother, Dolores, and sisters Faith, Cindy and Dee Dee also live the Detroit area. It’s been quite a life so far for Frank Tanana. And as he views it, the best is still to come.